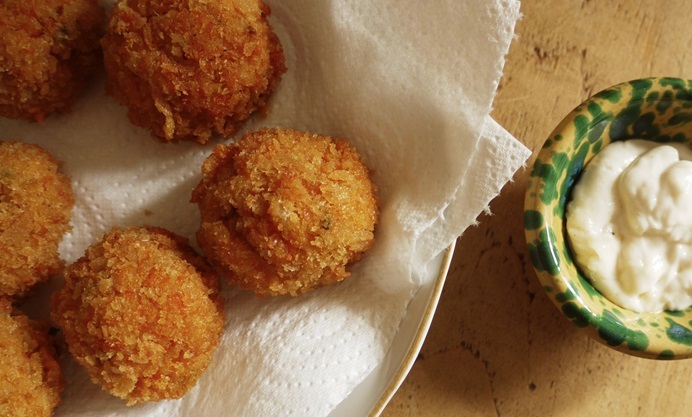 Kate Doran explores the flavours of one of Ibiza's favourite ingredients – sobrasada – in this decadent croquette recipe. Encased in a manchego breadcrumb coating, the Balearic cured sausage lends a rich and defiantly porky flavour to these tapas favourites. The first time I visited Ibiza was in my early twenties with a big group of friends. We sunbathed, drank and danced til dawn, as befits a trip to one of the clubbing capitals of the world. But a girl can’t survive on sangria alone and after a few non-stop days we decided to explore the local food scene. Platters of exquisite fresh fish, cured meats and everyone’s favourite finger food – tapas – later, it’s then that Ibiza truly came alive for me. On an island like Ibiza, the proliferation of delicious fish is to be expected, but they also specialize in delicious cured meats. Perhaps less well known than the Spanish exports of chorizo and morcilla, sobrasada is a traditional raw cured sausage made from black Balearic pigs. Smooth, spreadable and slightly spicy, it’s delicious spread on bread, but also makes for a delicious salty foil to the creamy béchamel sauce in a classic croqueta. You can find sobrasada in the cured meat aisle in major supermarkets, specialist Spanish delis or online. These croquetas are the perfect showcase for sobrasada, a crisp, light crust breaking open to reveal a creamy, rich, red middle. I like them dipped in an eggless garlic aioli, and a cold glass of sherry wouldn’t go amiss. 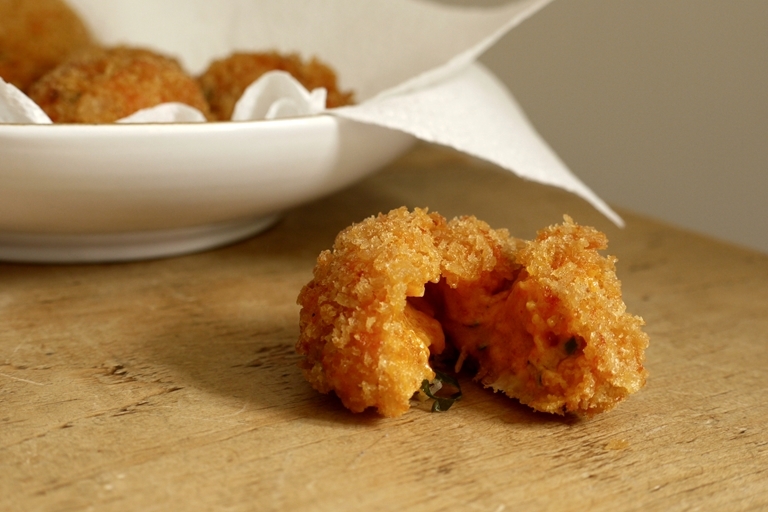 Serve these croquetas as a dinner party starter or as part of a tapas platter, with Spanish olives, cheese and padron peppers.